I haven't been on here for a couple weeks, and I apologize. I intended to post my weigh-in update from last Sunday, but time got away from me. Mainly because it was a HORRIBLE weigh-in, and I wanted to make sure I posted it so I could stress the importance of how lack of sleep and stress can effect your weight loss goals. So, I'll briefly explain, and then will talk about the importance of staying positive. The two weeks prior to my last weigh-in, I had allowed the stress from work and in my personal life, just control me and it didn't turn out well at all for me. Last week was the worst, with getting only about 7 hours of sleep all week. I was stressing about work and personal issues, and I was in a bad mood even going into my workouts. And it's one thing to be in a bad mood during my private sessions, Michael will get over it, but when it involves a group session I really try to go in and be positive and motivating but it was very difficult for me to do that the past couple weeks. So, that last week as I mentioned was the worst, and even though I didn't veer from the meal plan I still gained almost 9 pounds when I weighed in this past Sunday. And all because I stressed and didn't sleep well. It was very frustrating, but as Michael said, it is what it is! I'll weigh-in again this Sunday, and I'm hoping because I have been sleeping better and not stressing about things that I will have a good loss. I'll make sure to post the update sooner this time! 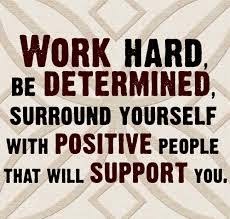 But, long story short, I can't tell you how important it is to surround yourself with positive people who will support you in all your efforts. Focus on what you can control; and anything that you can't control, just do the best you can and stay positive!